Low-NOx burners for a variety of oven applications are also available. Generally ovens operate at much lower temperatures than furnaces. However, process ovens often operate in large manufacturing facilities in nonattainment areas and, thus, require burner retrofits. 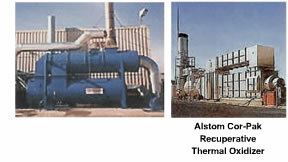 These burners utilize various methods of mixing the air and the fuel and also employ staged combustion techniques developed specifically for these applications. Typical reductions of NOx in the 80% range can be obtained. Specific information on various low NOx burners for ovens can best be obtained on the vendor's website. MACT standards have been developed for many industries that emit organic hazardous air pollutants (HAPs) from ovens. These standards require the removal or treatment of the HAPs that are emitted from ovens used for metal coatings, various types of paint baking, and other emissions in the general category of "evaporative losses." Natural gas technologies are often used to destroy these HAPs. Examples include direct thermal oxidizers, catalytic thermal oxidizers and carbon absorption systems. Originally developed to destroy VOC emissions from process sources, these are well-established technologies. Other available options include reformulation to use coatings and raw materials that do not produce HAPs. By reformulating solvent based coatings to powder coatings, low-emission gas infrared technologies can replace conventional ovens to meet emission standards. Each of the following technologies uses natural gas to reduce organic HAPs and to comply with MACT standards for emissions from ovens. A brief description is provided. Use heat to burn and destroy organic pollutants (VOCs, Air Toxics and Odors). Regulations determine time and temperature requirements for each pollutants' destruction. Direct, recuperative, regenerative and catalytic types available. Direct thermal oxidizers use large amounts of fuel, low capital cost. Recuperative thermal oxidizers preheat (to increase the temperature) the incoming flow of air and HAPs. Limited by air-to-air heat exchange economics. Regenerative thermal oxidizers use regenerative heat exchange with large canisters that cycle to preheat the incoming flow and minimize fuel consumption. Regenerative thermal oxidizers conserve fuel at low rates with the highest capital cost. Catalytic thermal oxidizers use a catalyst bed that results in lower required temperatures for destruction of HAPs. Catalytic oxidizers also consume lowervolumes of fuel, but catalyst issues can include cost, possible contamination and disposal. Based on selective adsorption of HAPs, uses activated carbon or other material to adsorb HAP. These systems utilize steam to regenerate the adsorption beds. Can be used to concentrate HAPs before incineration. Information on manufacturers of these technologies is included in the vendor listing.